Lord Coe said it had been a "ghastly week for athletics"
Lord Coe says the current doping allegations surrounding athletics could be as bad as the case of disgraced 1988 Olympic 100m champion Ben Johnson. A German TV station accused the International Association of Athletics Federations (IAAF) of not probing 150 suspect blood samples, including one of an unnamed British star. Russia has denied claims its officials were paid to supply banned substances and cover up tests, rejecting the allegations as "a pack of lies". Russian Athletics Federation president Valentin Balakhnichev said the documentary, shown by television channel Das Erste, was "a planned attempt to create an ugly scandal within Russian athletics and Russian sport in general". Coe, the double Olympic 1500m champion who successfully presided over the London Olympics in 2012, is an IAAF vice-president and will run for the world governing body's presidency next year. He told BBC Radio 5 live's Sportsweek programme: "In the 40 years I have been involved in athletics there have been big moments - Ben Johnson, Marion Jones, Balco. This is up there." Meanwhile, the Russian whistle-blower who said in the documentary that there was widespread doping in Russian athletics is now in hiding with his wife and child for fear of his life, according to the Sunday Times newspaper (subscription required). "We felt it would be safer for us to leave Russia," explained Vitaly Stepanov, who added he witnessed the corruption when working at the country's anti-doping agency. "The system is so corrupt, they would select three to five athletes in each event and allow them to compete dirty at the national championship." Ben Johnson (far left) points to the sky after winning the 100m at Seoul Olympics - he was stripped of his medal three days later after testing positive for steroids. The IAAF and the World Anti-Doping Agency (Wada) have said they will look into the claims. Coe said he had not seen the list of blood samples spoken about in the documentary and called for the German documentary maker to send in his information. "It has been a ghastly week for athletics. We have to bring this tawdry episode to a close as quickly as we can. I don't know about the existence of the list," he said. "The IAAF does not know what it contains and whether it has any veracity at all. If there is more info out there then please let us know. "If the German journalist thinks our organisation is sullied - I can understand why people are questioning it - we would take a Wada official along. My instinct is that the list won't be central to the allegations, there are federations who may have been involved in systematic doping and officials have been involved. I am not afraid of embarrassment. We have to get to the bottom of it." 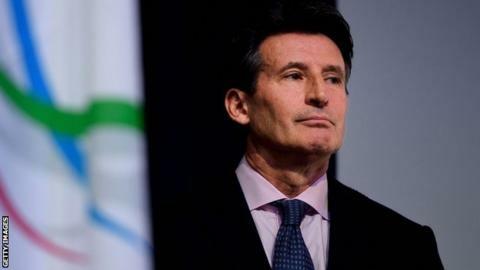 When asked if he feared the allegations were equivalent to the doping scandal in cycling, Coe said he did not want to be drawn on benchmarking against other sports, but added: "A light has been shone on something that clearly needs investigating. If this is provable of course it is [as bad as Ben Johnson]." Canadian sprinter Johnson was stripped of his gold medal in the 100m at the 1988 Seoul Olympics after officials discovered he was on steroids. US athlete Marion Jones was similarly disgraced after it was revealed she supplemented her training for the 2001 World Championships, where she won 100m silver and 200m gold, by slipping tablets provided by Victor Conte's Bay Area Laboratory Co-Operative (Balco) under her tongue. Conte later said he had watched Jones inject herself with human growth hormone and that he had given her five different performance-enhancing drugs before, during and after the 2000 Olympics, where she won five medals of which she was later stripped. Jones was given a six-month prison sentence in January 2008 for lying about steroid use and involvement in a drugs fraud case. Why does Lord Coe want top job?